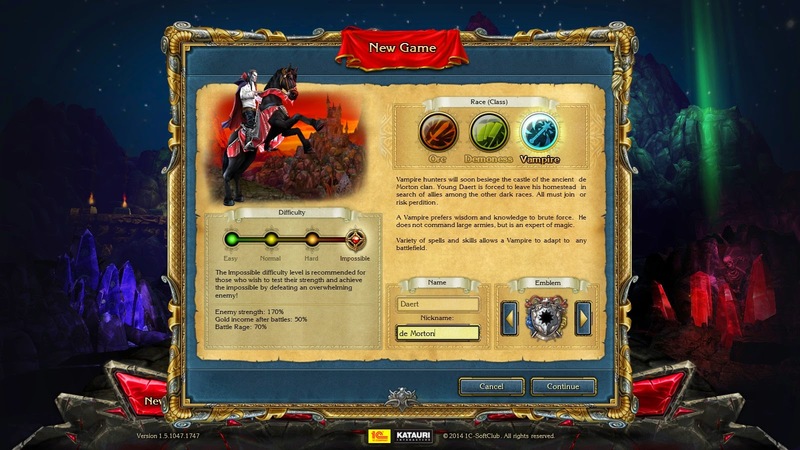 King's Bounty games have four difficult settings: Easy, Normal, Hard and Impossible. The difference between difficulty settings varies a little from game to game, but basically what is affected is the rate at which you gain rage and the amount of enemies you have to face. In King's Bounty: Dark Side, Impossible difficulty means fighting 170% of the enemies you would have fought on normal. To get a sense of what that means, let's talk a bit about how the game plays. Battles take place on a hex field. When a unit attacks another unit in melee, the victim counterattacks, but each unit can only counterattack once a turn. When a ranged unit attacks in melee, it does half damage. Of course there are lots of exceptions to these rules for individual units, but basically your units walk towards each other and fight. You have five different units in your army, and how many of each you get is determined by your leadership score. An imp, for example, has 40 leadership, so you if you 300 leadership you can have 8 imps in your army. Because you can only have 8 imps regardless of whether you control on stack of 8 imps or two stacks of 4, and because you only have five stacks, usually you'll want five different types of units to maximize your total army. So lets say you have 300 leadership and go into an even fight with an enemy with 300 leadership. Both of you have zombies. Zombies have 30 leadership, so you each have 10. Zombies attack for 3-4 damage each and have 36 health. So an attack from the one stack to the other does either 30 or 40 damage, either killing on zombie or not. The battle, obviously, is a coin flip, though strike first carries an advantage. Now instead of 10 zombies the opponent has 17. Your zombies strike for 30 or 40, with a 50% chance of killing one enemy zombie. Their zombies strike for 51 or 58, killing one of your zombies and half killing another. Next round you attack with 9, then maybe only 7. On average when their zombies have wiped out yours, they've still got 14 left. So 70% more isn't really 70% more. More leadership increases both the health and the damage of the stack, so 170% is a lot more like 289%. Enemy stacks were larger than yours most of the time on Normal difficulty, so it's less like three times the strength and more like four or five times the strength. They don't call it impossible for nothing. Of course you don't march your units into the middle of the field and fight to the death, this is a game of tactics, but when facing a force of five times the strength, where their ranged units can shoot down your troops in a round or two, and their melee units can half kill yours with a single attack - there is only so much tactics can do unless some truly ridiculous nonsense going in your favour. I recently started playing Impossible difficulty with the vampire - the wizard class of Dark Side. I'm not sure this is exactly a Let's Play, but I'll be posting about my progress as I try to find the right mix of nonsense to get through.